Last night our bookclub had the pleasure of Skyping with best-selling author Ayelet Waldman. 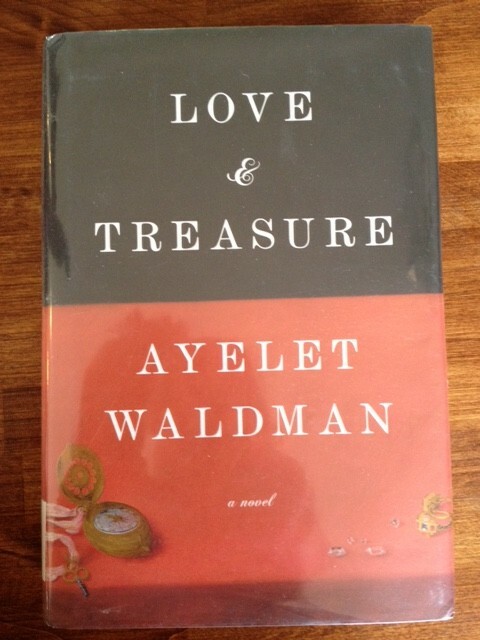 On the eve before departing for Europe, she carved out time to talk with us about her latest novel, Love and Treasure. It was fascinating to hear her describe what first gave her the setting and time: she was certain she wanted to take on the subject of the Holocaust, but from a new perspective. She also wanted the work to explore the art world and decided it should take place in Hungary (in conjunction with an upcoming trip.) Thus, as a result of a Google search on the words ‘Holocaust,’ ‘art,’ and “Hungary’ the novel was born. The story, which is told in three parts not unlike The Hours, covers the period from the early 19th Century through the close of World War II to the modern era, but not necessarily in chronological order. The three parts are told mostly from a male point of view, but as an examination of the women around them, who are really pushing the plot forward. The cast of characters are vast–ranging from a World War II officer with a troubled conscious, a suffragette and her “midget” assistant, a Freudian therapist, and a Syrian art dealer to name a few. It is a powerful story that lays bare the value placed on art and precious things versus the life of the owners who were all but exterminated during the Holocaust. Having “met” the author, I have to say I found her personality sparkling. She was funny, irreverent, and upbeat as she joked about her Spanx purchase for her trip to Paris and dragged her daughter into the room to show off a new hair-do. It was hard to imagine her taking on such a weighty topic, but she accomplished it with impressive historical detail and lyrical prose.